Each of our prestigious Deer Valley vacation homes offer a unique design, appeal and location that will leave a lasting impression on any Park City traveler. These immaculate private vacation rentals include cozy 3-bedroom homes to a massive 10-bedroom, 14 bath villa estate that sleeps 33 with ski-in/ski-out locations. 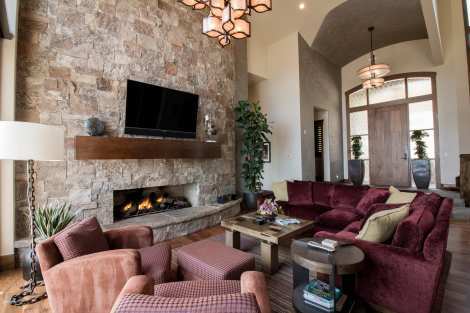 Experience all of the luxury and comfort Deer Valley Resort in Park City has to offer! 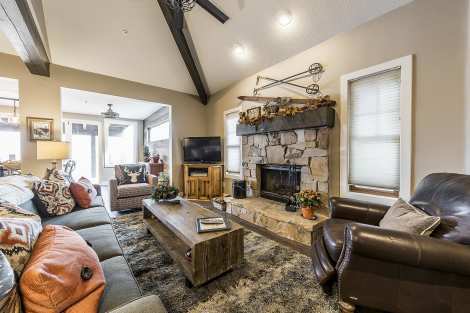 Whether it's the coveted Silver Lake area, or the convenience of Lower Deer Valley's Snow Park area, any one of these beautiful Deer Valley homes is sure to be the ideal lodging solution to your next Park City vacation. Sensational views of soaring peaks and blue skies create the perfect backdrop for this brand new, never been lived in contemporary luxury estate sitting atop of Deer Valley’s bald mountain in the exclusive Deer Crest gated community of elite ski homes. With 10,057 square feet of luxury living space , this 2016 contemporary abode designed by renowned architect Michael Upwall, offers 6 bedrooms and 11 baths that can accommodate a group of up to 28 comfortably.With a fabulous ski room leading out to the Lost Fawn Ski Run, a theater , sauna and secondary recreation space, this mountain contemporary chalet is ready for your next dream vacation. 4 luxury king suites adorn the property , ideal for families or corporate stays. The additional two bedrooms offer two sets of queen bunks ( sleeps 8 ) and three sets of queen bunks ( sleeps 12) respectively , ideal for either single adults, young couples or groups of children alike. The property is designed for entertainment with both theater room on the inside and panoramic views from the hot tub on the outside! 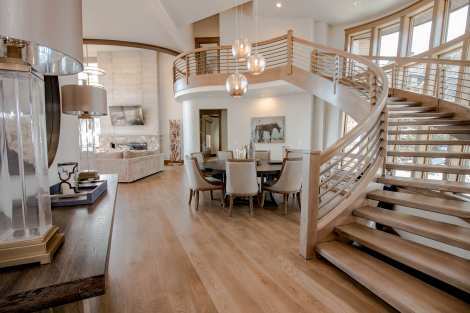 A contemporary mountain masterpiece awaits you for next ski trip or corporate getaway to Park City! *There is additional furniture and built in bunk beds that has been recently installed in this home that has not yet been photographed. New photos are coming soon. 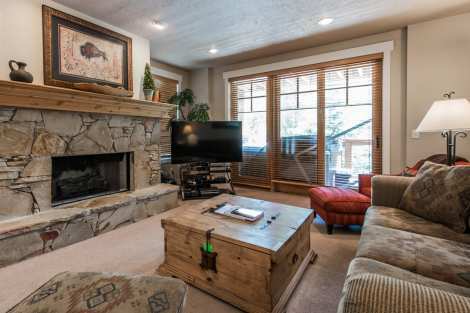 Stunning Deer Crest Chalet with World Class ViewsIncredible mountain view surround this world class, ski in ski out luxury estate in the exclusive, gated Deer Crest neighborhood. This 6 bedroom 9 bath sprawling residence offers ideal ski access, exquisite furnishings, soaring ceilings, unique contemporary architectural elements and perched in the most desired spot along private Deer Crest ski access leading to the Jordanelle Gondola, that set this 9,000 square foot spectacular estate apart from any other in Deer Valley. Smart Home technologies coupled ambient mountain contemporary living space make this lux residence truly a great entertaining and relaxation space for both families and corporate retreats alike. Stunning lake and mountain views will have you mesmerized from the large picturesque windows . The home offers multiple levels of great room space to complement the privacy offered in each large luxury suite. Three King master suites with gorgeous en suite baths, a queen suite with two queens, and 2 separate custom bunk rooms , one of the bunk rooms being a 6th bonus room, with 8 queen beds in total, which all offer masterful baths. Arguably our finest offering in Park City and Deer Valley for the most discerning traveler. 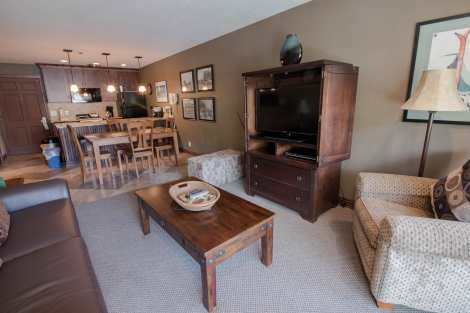 You can relax and unwind after skiing in privacy, or join in the fun with all this property has to offer , apres ski . There is never a dull moment in this residence, with home theater room, billiard room ,wine cellar, fitness center and more ! Create a memorable experience at this luxury Deer Valley ski residence. 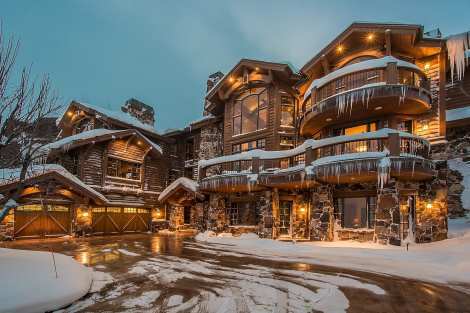 Situated atop Deer Valley’s majestic mountain peaks in the gated exclusive community of Deer Crest, this 9800 square foot luxury mountain estate perches over abundant ski slope and lake views that elevate the skyline. 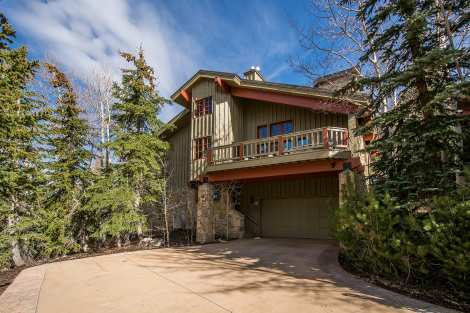 Enjoy the serenity and convenience of ski access out the back door, yet an abundance of privacy and security . Rest assured this home has every luxury creature comfort for your lodging experience. With multiple living spaces and seven estately bedroom suites to choose from, relaxation and privacy , along with family entertainment options are endless. The property’s unique architectural details highlight dramatic vaulted stone work and mountain timber wood finishes native to Utah. The large open space family entertaining areas coupled with private enclaves, provide just the right balance for groups seeking corporate retreats as well as families alike. Enjoy a recreation rooms with bar area, pin ball, wine cellar, theater room, golf putting green exercise room, sauna , hot tub and outdoor entertaining space to name a few of the many features. Ski out the door nearest the Mountaineer Lift and onto Deer Valley’s coveted slopes to any of the lodges offering gourmet lunch and apres ski cocktails. 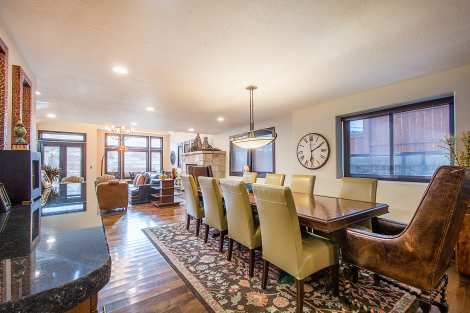 The Deer Crest neighborhood is ideally situated , with a quick drive out of the gated community to the streets of historic downtown Park City below, or a hop onto the highway to the private airport hanger in Heber Utah. Whatever your needs, you are sure to enjoy the surroundings of luxury amenities and appointments at this Deer Crest mountain estate. Newly constructed and offering 5,800 square feet of living space, this five bedroom, seven bath home includes a large bottom floor with a comfortable sofa bed and full bath area was built using the highest quality finishes and fixtures with custom décor throughout. Each room has been thoughtfully put together to allow for comfort paired with sophistication. 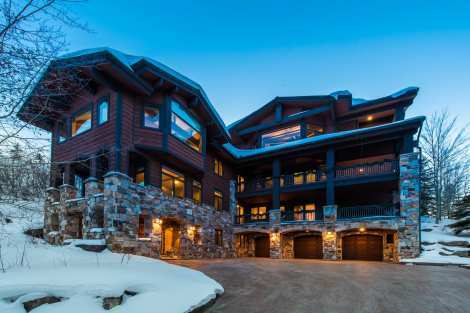 Beyond five-star, this ski home features all custom furniture, bedding and lighting accents. Also included in this property are both a private on-deck hot tub, pool table and entertaining area, sauna and steam room.The perfect retreat after exploring the ski slopes or mountain bike trails. If your outdoor expeditions aren’t quite enough, a treadmill and stationary bike are on site as well. Although the interior of this home is beyond spectacular, it’s location couldn’t be better. 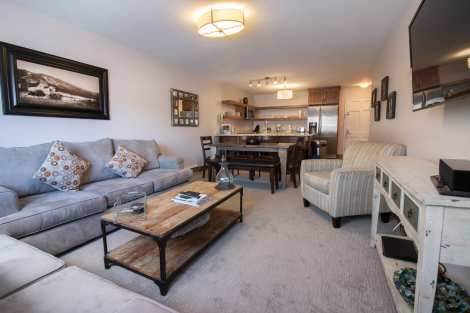 Located just across the street from the free shuttle station, guests gain access to free and easy transportation all throughout the Park City and Deer Valley area by just walking out the front door. Main Street is also just a very short walk away allowing ease of access to all the shopping, dining and nightlife you could imagine. 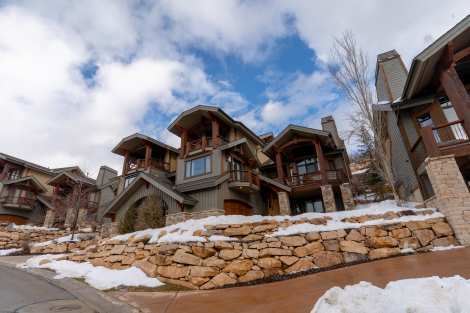 Live the glamorous ski town life – relish a stay in this Deer Valley Luxury town home. Great location and standard of accommodation. Cannot really fault it; would return and have told friends this is the place to stay. Thank you. Great location and a great condo. We would definitely stay here again. Lolly the Trolly was our best friend getting back to the room! We love Park City and felt for the money and convenience of the Arts Festival this hotel was fantastic! Loved the suite layout and overall experience!